During the cooler months we all dream of relaxing by the pool or splashing around with friends and family. One of the easiest ways to beat the summer heat is jumping in the water. Luckily, the Valley has some great swimming holes, including community pools and lakes. The ocean may be far away, but beautiful fresh water and sandy beaches aren&apos;t. Doubling Gap Lake at Colonel Denning State Park offers fresh, cool water for swimming enjoyment as well as a beach perfect for enjoying the sun or playing in the sand. The 3.5 acre lake also presents a scenic mountain backdrop. It is open from 8 a.m. to dusk and has food concessions Friday and Saturday. Pine Grove Furnace State Park offers two great swimming locations. Much like Doubling Gap Lake, Laurel Lake features a sandy beach and mountain backdrop. Laurel Lake spans 25 acres and is open from 8 a.m. to sunset. Fuller Lake is also located in Pine Grove Furnace State Park and has lifeguards on watch from 11 a.m. to 7 p.m. daily from Memorial Day weekend through Labor Day weekend. Both lakes open in early May and close at the end of September. Pine Grove&apos;s other offerings include hiking, biking, and fishing. Little Buffalo State Park, in nearby Newport, features a state-of-the-art swimming pool with depths of up to five feet, two waterslides and a sprayground. The pool has an ADA-accessible ramp and is open weekends only beginning Memorial Day through the second weekend in June, daily through mid-August, and weekends through Labor Day. Hours are 11 a.m. to 7 p.m. 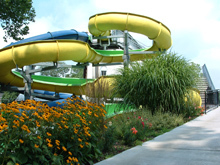 If you&apos;re more into diving boards and slides there are some fantastic options around Cumberland Valley for you to check out. The Boiling Springs Pool located on Mountain Road offers four pools, three waterslides, and a full service snack bar. Certified by the American Red Cross swimming lessons are available. Special events include Summerfest in June and $5 Fridays offered six times throughout the summer. The pool opens Memorial Day weekend and begins daily operations in June. Another great pool location is the Hampden Township Pool. The 550,000-gallon pool features a 120 foot waterslide. Other park features include a tot pool, spray ground, and concession stand. Swimming lessons, Deep Water Aerobics, and scuba classes are offered at the pool. The pool opens Memorial Day weekend and daily beginning in June. The Carlisle Community Pool is situated on 3-acres and offers a large “z-shape” main pool ranging from three to 12 feet in depth and featuring a newly-renovated giant twisting water slide, Aqua Climb wall, lap swimming area, and diving board; two large shade shelters; and grass space for activities and sunbathing. Young children can enjoy a wading pool with a teacup water feature. A fenced-in recreational area includes a lighted pavilion with 8 picnic tables, 2 charcoal grills, basketball, volleyball, and shuffleboard. Drinks and food are available from the concession stand and lounge chairs are available to rent. Non-resident rates are available. The Mechanicsburg Outdoor Swimming Pool touts a 22-foot tall water slide and opens Memorial Day weekend, with daily operations beginning June 7. Non-residents are welcome. The Shippensburg Memorial Pool offers a water slide, baby pool with dew drop fountain, and concession stand. The pool is open Memorial Day weekend through Labor Day weekend, but is closed during school days. Non-resident rates and pool rentals are available. The Camp Hill Borough Municipal Pool is open Memorial Day weekend and then re-opens the first weekend in June and remains open daily until Labor Day. Non-resident rates are available to those who live in Lemoyne Borough, Wormleysburg Borough, Hampden Township, Lower Allen Township and East Pennsboro Township. The Lemoyne Community Swimming Pool is opem from Memorial Day weekend daily through Labor Day weekend, but is not open when school is in session. The pool features a water slide and other fun features.